Replacing an old roof is a major investment and a big project even when everything goes as planned. Yet a new roof installation can turn into a real headache (and a very literal one) if bad choices are made and certain procedures are not followed. People with asthma, allergies, migraines and small children are especially susceptible to odors, volatile organic compounds (VOCs), and noise. If you or your loved ones belong to a high-risk group related to respiratory problems, extra precautions should be taken. 1. Hire licensed, experienced contractors. It may sound like an obvious thing to do, but you would be surprised how many improperly licensed contractors are out there and how many homeowners do not check their track record and ask for testimonials. Needless to say, someone who didn’t bother properly registering and operating their business are a lot less likely to care about the quality of their work and the health of your family is probably not very high on their priority list. 2. Always replace all old shingles and roofing underlayment. 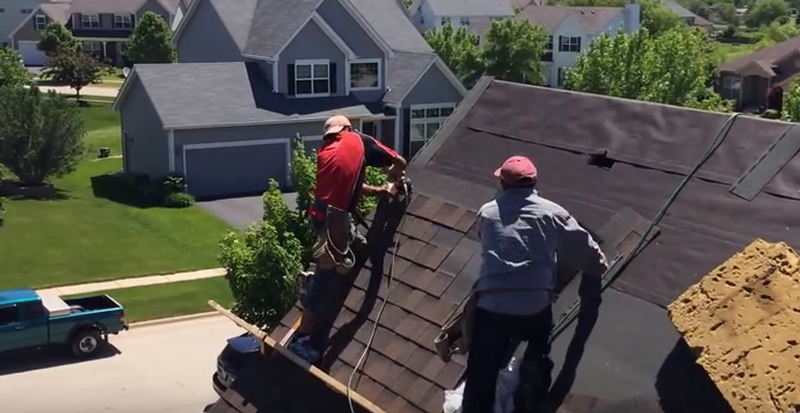 During a new roof installation, always demand that your roofer removes old shingles completely (including remnants of the old roofing underlayment) and uses high-quality underlayment before installing new shingles. Some roof sheeting is glued together with formaldehyde based glue. Formaldehyde and benzene are considered by many authorities to be proven or probable human carcinogens (cancer-causing VOCs). Using new generation synthetic underlayment (especially the adhesive kind) reduces the risk of human exposure to dangerous chemicals. 3. Leave your home during the removal of the old roof. The truth is, most materials used in modern day roofing aren’t dangerous to humans or pets, but dust and small particles from the old roof being removed can be a temporary nuisance for residents, especially for those who already have respiratory problems or are prone to migraines or allergies. So the best way to avoid potential short-term negative effects on your health and general well-being is not to be home during the removal of your old roof. For experienced roofers, it takes only a few hours to remove your old roofing materials. Let them do their job, let the dust settle and let the crew clean up the area before returning to your home for the night. 4. Make sure your attic is properly sealed and vented. This may sound like a contradiction, but it’s not. Once the new roof has been installed, if the attic is not well sealed from the rest of the house the tar-paper and other underlayment products used in the roof can produce odors that may easily enter your house. At the same time, new roofs can and often will produce an odor of asphalt, especially during hot, humid summer days in certain climate zones (this is called off-gassing). Make sure the attic is properly vented and while it is sealed from the living space. 5. Periodically check your roof for leaks and keep humidity low. Dust mites and mold thrive in moisture. Keep an eye for any possible leaks while keeping humidity around 30%-50%. A dehumidifier (and air conditioner during summer months) helps reduce moisture in indoors and effectively controls any potential allergens.